Whirlpool dishwasher displaying an error code or flashing lights? If your dishwasher detects an error in the system, it will show an the appropriate error, the lights flash, will blink, or a fault code will show. When lights are blinking your dishwasher is identifying a specific fault. The light blinking sequence will indicate which part on your Whirlpool dishwasher needs to be replaced. Some Whirlpool dishwashers display an error code by flashing the clean Light on the display in a pattern. If your Whirlpool dishwasher does NOT have a digital display, the clean Light will flash the function code then the clean Light will pause for 2 seconds and then will flash the problem code. 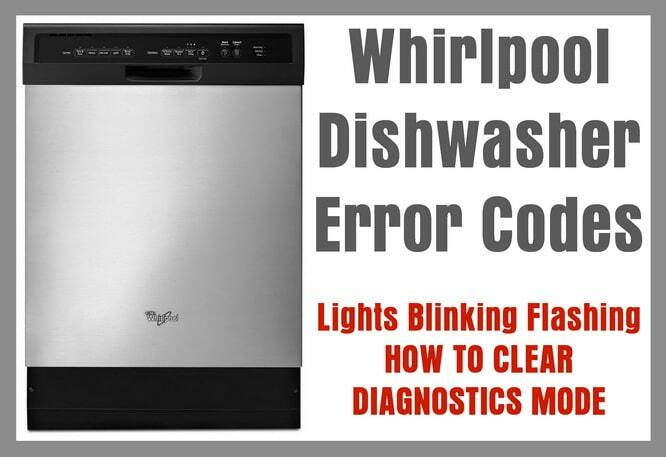 You need to count the number of times the clean light flashes to find out the error code on your Whirlpool dishwasher. As an example: If the clean light flashes 5 times followed by 2 flashes (5-2) then this error is showing the function code = “Door issue” and the problem code is “The door switch is in question”. The flashing light patterns repeat again after a 5 second pause. NOTE: The control panel console is fully non-functional when an error code is flashing. NOTE: You may attempt to run a diagnostic test cycle to find errors. Beginning the test cycle is different on dishwasher models. 1 – Turn the dishwasher on. 2 – Press the rinse cycle button. 3 – Turn the dishwasher back off. 4 – Hold down the start button while you turn the dishwasher back to on. 5 – When the light starts flashing immediately let go of the start button. 6 – Press the start button one time and shut the dishwasher door. 7 – The test cycle should start. 8 – If an error is found the cycle will stop, the flashing error code will then display. Repair or Check = Remove power to the dishwasher for 5 minutes to try and reset. If the error code comes back when power is applied then check the wiring and the components. If the wiring and components check out then replace the electronic control board. Repair or Check = This error code will show when the wrong user interface control is installed. Repair or Check = If no keys work replace the electronic control panel. If the control panel is damaged then replace the electronic control panel. If the control panel is in working order then the problem may be within the electronic control board. Repair or Check = Remove power to the dishwasher. Check the wiring between the user interface control and the electronic control board. If the wires and connections check out then replace the user interface control board. If the problem comes back then replace the electronic control board. Error Condition = There may be a break in the electrical wiring OR the thermistor (water temp sensor) component failed. The optical water indicator that detects the amount of debris in the water may have also failed. Repair or Check = Remove power to the dishwasher and check the wiring for the thermistor and optical water indicator circuit. If the circuit wiring checks okay then replace the thermistor and optical water indicator component. Repair or Check = Remove power to the dishwasher and check the wiring for the thermistor / optical water indicator circuit. If the circuit wiring checks okay then replace the thermistor / optical water indicator component. Repair or Check = Remove power to the dishwasher and clean the optical water indicator. If the error code comes back once you apply power then replace the optical water indicator (OWI). Repair or Check = Remove power to the dishwasher and check the wiring from the wash pump motor to the electronic control board. If the wiring checks to be okay then replace the wash pump. If the problem comes back then replace the electronic control board. Repair or Check = Press start button and close the dishwasher door. If the code shows then remove power to the dishwasher. Check the door latch assembly and the wiring for the door switch. If the latch assembly and the wiring are in place and check good then replace the door switch. Repair or Check = Check to be sure the wiring in the door switch checks good. If the door switch wiring checks good then replace the door switch. Repair or Check = Remove power and turn off the water supply to the dishwasher. Be sure the water supplying the dishwasher has proper flow and good pressure. Check wiring to the water inlet valve. If the wiring checks good and the water supply checks out then replace the water inlet valve. Repair or Check = Remove power and turn off the water supply to the dishwasher. Be sure the water supplying the dishwasher has proper flow and good pressure. Check wiring to the water inlet valve. If the wiring checks good and the water supply checks out then replace the water inlet valve. If the problem persists then replace the electronic control board. Repair or Check = Check the water fill level. Check for suds in the fill water at the bottom of the dishwasher tub. If the water fill level is low then replace the water inlet valve. If you find excess suds then check the detergent dispenser and replace it if damaged. Repair or Check = Check the overfill float switch and make sure it is not stuck under there is something under it holding it up. Be sure the water inlet fill valve is shutting off the water when the dishwasher is turned off. Repair or Check = Use thermometer to check the water temperature coming into the dishwasher. If the water is lower than 110F degrees then check your water heater. Adjust water heater if needed. If the water temperature coming into the dishwasher is between 110F to 120F degrees then replace the thermistor / optical water indicator or as last resort the electronic control board. Repair or Check = Remove power to the dishwasher. Check the wires to the flow meter. If the wiring checks good then replace the flow meter. Repair or Check = Remove power to the dishwasher. Check the heating element and replace it if you find it to be burned or faulty. If the heating element checks good then check the wires to the heating element. If the wiring checks out then replace the heating element. Repair or Check = Remove power to the dishwasher for 10 minutes. If the error code comes back when you turn power back on then replace the electronic control board. Repair or Check = Remove power to the dishwasher and turn off the water supply to the dishwasher. Check the drain path to see if something is blocking it. If the drain path is clean and completely clear then check the wires on the drain pump. If the wiring check out then replace the drain pump. Repair or Check = Remove power to the dishwasher and turn off the water supply to the dishwasher. Check the wires on the drain pump. If the wiring checks out then replace the drain pump. Repair or Check = Remove power to the dishwasher and check the drain pump wires. If there is damage to the the wire harness replace it. If the wiring harness checks out then replace the electronic control board. Repair or Check = Remove power to the dishwasher. Remove the outer door panel. Check the wires in the detergent dispenser. If the wiring check out then replace the detergent dispenser. Repair or Check = Remove power to the dishwasher. Check the wires for the the drying fan. If the wiring checks out then replace the drying fan. For other Whirlpool dishwashers that have a digital display, here are more error codes. 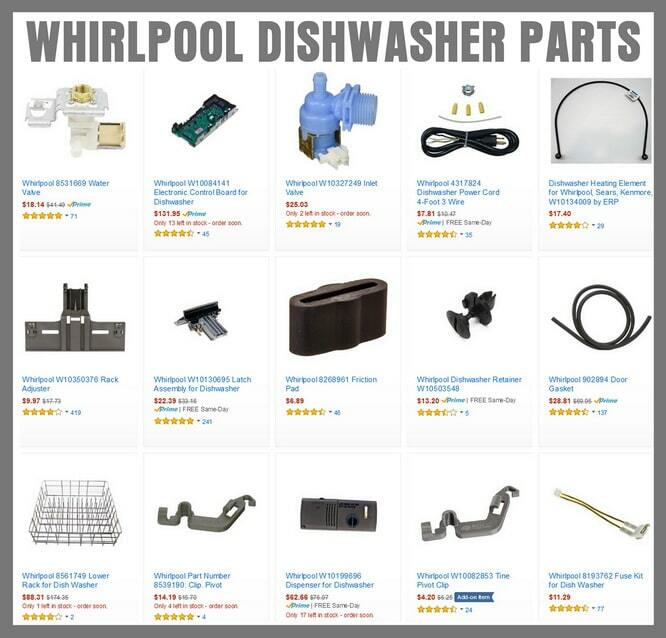 If you need replacement parts for your Whirlpool dishwasher one of the parts listed above may be causing your Whirlpool dishwasher to have flashing or blinking lights. If you need help identifying what the flashing lights on your Whirlpool dishwasher mean, please leave a question below and we can assist you with troubleshooting. A pipe in the ceiling burst and water poured down through all my recessed lighting. I noticed the water level was so high in the dishwasher, it leaked out onto the floor once the water from the ceiling had been shut off. I pressed the start and drain down after I had bailed the level down, and the dishwasher drained. I turned it on tonight to wash the dishes an the E2 F2 codes were still flashing and nothing got it to stop flashing. The water is out. Now what should I do ? Thank you. I’m working of a Whirlpool dishwasher, model WDT720PADM1. Using the 123-123-123 button push method I’ve successfully run the service cycle. It shows codes F6,E6 then F6,E4 then F7,E1 and finally F8,E2. Each alpha-numeric combination blinks on 3 times, then it moves on to the next combination. What do these codes mean or where can I find that information. Then too, I’ve not been able to delete codes so some of these may no longer apply. How do I deleted old error codes or find that information. So, far, everything I’ve tried with the machine seems to be working OK.
Our whirlpool dishwasher, owned for the past 10 years quit working. When we try to turn it on, the heavy and normal light will come on, will blink a few times then will stop blinking but the lights stay on. Sometimes the start light will come on but not every time. It did start one time but stopped after about 3 seconds. It won’t start at all for us to run any test. Any idea what we’re dealing with. I have just resolved a lights blinking error in my Whirlpool dishwasher. I scanned the web looking for a solution and eventually found I should remove a flap from within the water flow direction channel which allows a choice to only wash lower deck or upper deck or both. 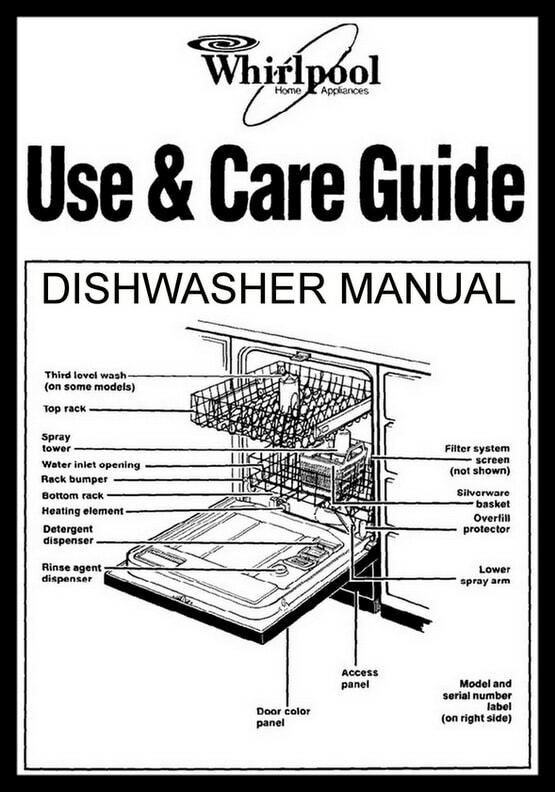 So I learned a lot about the various working parts of the dishwasher. It all turned out to be a simple solution. Any shorting of the electronics by water will cause a fault error code. I found that the drain hose pipe was leaking back into the under metal tray and causing the bobbing polystyrene failsafe off switch to activate which stops the machine and causes blinking lights. The replacement hose cost me €16.00 and now it is back working perfectly. First thing to do is replace the drain hose and see if this cures it. Try to see if there is any water leakage from the drain hose back into the under tray causing a short circuit. This caused my 16 year old dishwasher to do exactly what yours is doing. Replace drain hose and see if this works. Its a very cheap test run. Hi, my dishwasher is a whirlpool DU1055XTVs2, the NORMAL cycle light flashes on the panel, already changed the control board did the whole diagnostics without problem and it worked for one day. Now it is back to the flashing normal cycle light with no response and can get into diagnostics. Is it the control panel? My whirlpool quietpartner ii blinks 7 times over and over, not sure what error that is. I have the same issue. Did you find a repair for it? My whirlpool dishwasher was bought in 2010 and clean light flashing with no special way to indicate problem, just 2 seconds pose and no able to reset or start. One of website said I should push “high temp dry” and “high temp wash” button continuously which will reset control board. Should I try this one? I have a whirlpool dishwasher which is 16 years old and has always worked wonderfully…. I thnik perhaps someone turned it off in the middle of a cycle. What should i do to rectify it? My dishwasher is ABP 4109 and it blinks continuously in cycles of 3. Our less than 2 yr old dishwasher is blinking between E2 and F2. From above F2 states a water leak has been detected. Whirlpool Quiet Partner III starts to fill with water but stops just shy of the heat element. There is a slight buzzing sound but the machine will not progress beyond this point. I have run the diagnostic but get no code. No flashing lights. The machine will drain. Did you ever figure out the problem? I’m currently having that EXACT same problem with mine and, before I get someone out to repair it, I’d like to know if it is something I can do myself. If trying to reset the Whirlpool dishwasher panel does not work and it continually blinks or flashes, it is your control panel keypad assembly that has gone bad or a stuck key is causing the issue. Previous post: My Airline Boarding Pass Does Not Have TSA Precheck On It – How Do I Get It?